By now, you are all likely used to the President of the United States attacking America’s free press, but now it appears that he’s turning his attention to others, those who amplify what he calls ‘fake news’. In two tweets made at approximately 5:30 am local time, President Trump focused on Google, alleging that the $850 billion company is “suppressing voices of Conservatives and hiding information and news that is good,” while vaguely threatening that he will be taking action. “Google search results for ‘Trump News’ shows only the viewing/reporting of Fake New Media. In other words, they have it RIGGED, for me & others, so that almost all stories & news is BAD. Fake CNN is prominent. Republican/Conservative & Fair Media is shut out. Illegal? 96% of results on ‘Trump News’ are from National Left-Wing Media, very dangerous. Google & others are suppressing voices of Conservatives and hiding information and news that is good. They are controlling what we can & cannot see. This is a very serious situation-will be addressed!” the president tweeted this morning. HillReporter did a quick search for “Trump news” after reading this tweet, and we quickly found that not only was there not a single case of false information within the first two pages of these results, but links to Fox News appeared in 3 of the first 7 results on the first page of Google. 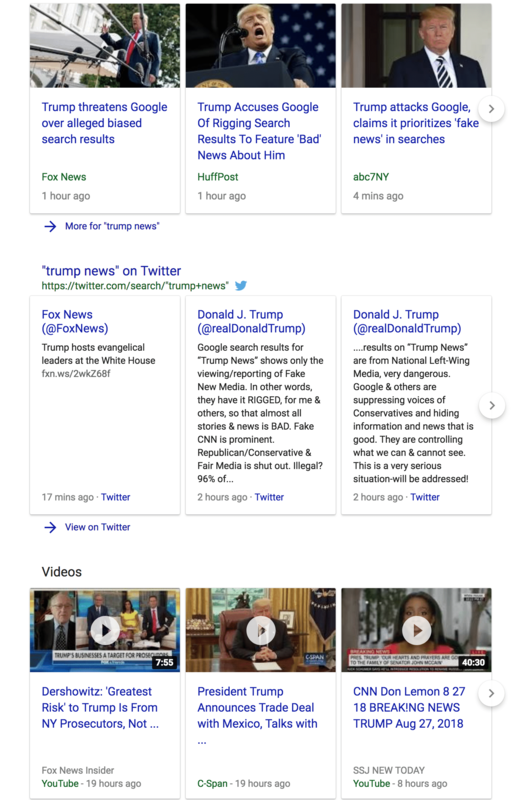 In fact, Trump’s favorite network, Fox News, was the only organization that appeared more than one time, appearing 4 times, on the first page of Google’s results. This included the top result for “news”, the top result for “tweets”, the top result for “videos”, and the second result for website links, as you can see to the right. The President appears to be trying to confuse the populous as to what is real and what is fake, as negative news continues to flow out of multiple investigations, the White House and anonymous sources, via the mainstream media. Most legal scholars we’ve talked to believe that there is little the President can do to force a corporation like Google to manipulate their own search results in his favor. This morning’s tweets seem to be more bluster than bite.